Two decades on from the birth of garage in the UK, its resurrection is afoot on the global electronic music horizon. 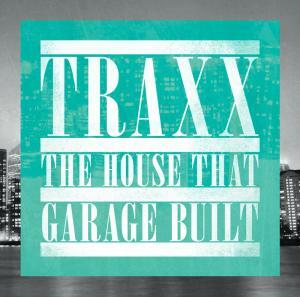 Traxx ‘The House That Garage Built’captures the original sounds of New York and New Jersey house and maps their evolution through to the UK interpretations of today. Spotlighting a new school of producers that use old school techniques against some clever bass manipulation to bring the sound up to date,‘The House That Garage Built’ is high energy and captures a moment in time where dancefloors are coming alive with a new raw and edgy rhythm that´s both mysterious and spellbinding. Plotting out artists such as Disclosure (who you’d have to have your head buried underground to have missed in 2012), the dexterous wizard Huxley,and Hot Flush prodigy George Fitzgerald, gifted artists that have seen major recognition and even chart success in the past year. Traxx also shines the light on some newcomers set for the same path such as Ben Pearce, whose 2012 underground hit ‘What I Might Do’ is served up in remix form by Harry Wolfman on the mix, Needwant’s own Ejecawith the elastic grooves of ‘Horizon’ and London based duo Dusky whose‘Flo Jam’ cut is a furtive bomb. Exclusive track highlights also present on the compilation include productions from Frenchman The Mekanism, Purple Velvet, Munich youngsters Rhode & Brown and LA based Rhythm Operator. As it happened the first time round, music maestros are moving from their love of house and disco to dirty basslines and broken beats. Brands like Rinse take centre stage and a generation that grew up with an already rich history of electronic music create their own strains, fusing together what went before. In true contemporary fashion and unlike the original garage sound phenomenon, the music Traxx covers is now as accessible for artists and DJs such as Maya Jane Coles, Jamie Jones, Rob Da Bank and Sasha as well as pioneers of the genre such as T Williams and Boddika. A true testament that this musical revival appeals to all walks of life and has found a foothold in the worlds of techno, dubstep, acid as well as nu-disco and house. Traxx is the latest concoction from London’s prestigious disco and house imprint Needwant who are responsible for some stellar releases from the likes of Kim Ann Foxmann, Mario Basanov and Ejeca. The London based label has won iTunes dance music compilation of the year for their popular Future Disco series and continues to spot movements and showcase their findings at worldwide events in far flung locations such as Ibiza, Amsterdam, Dubai and Singapore.